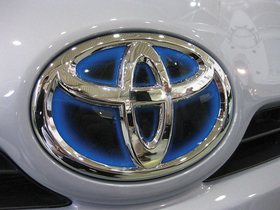 Starting with the redesigned Prius this year, Toyota's hybrids get blue-tinted Toyota "sombrero" badges, supposedly to telegraph their green drivetrains. "Blue is green with technology. It's a clean and fresh color, and I think that's what people are looking for."